Sir Jackie Stewart has described double World Champion Sebastian Vettel as “the most mature 24-year-old racing driver” he has seen. Vettel made history in Japan on Sunday when he not only secured back-to-back Drivers’ titles, but also became Formula One’s youngest double World Champion. Three-time Champion Stewart, who failed to successfully defend any of his titles, lauded Vettel and admits he didn’t think the German would win the Championship this year. “My best years were my last three years of racing. I was able to deal with things better because I had more experience, more knowledge and a little bit of wisdom. 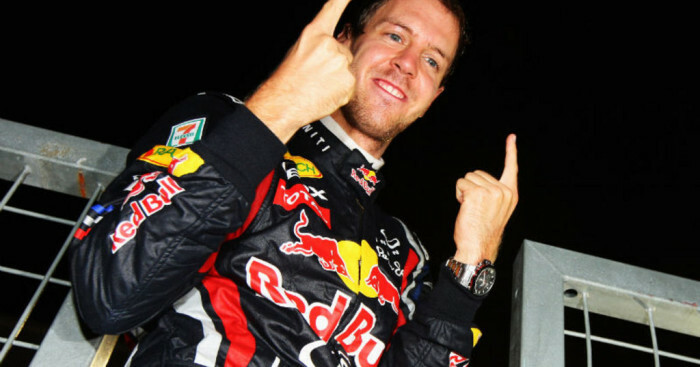 Sebastian Vettel has that at a younger age than I have seen in any other driver,” Stewart wrote in his Daily Mail column. “Although his Red Bull was dominant last year, he occasionally showed a lack of maturity in making mistakes that a more experienced driver might have avoided. This year he is unquestionably the most mature 24-year-old racing driver I have seen. “He has made slight errors, such as losing in Canada to Jenson Button, who was supreme that day. But his second World title is an incredible achievement for one so young. To win Championships back to back, with all of the distractions that being World Champion entails, requires motivation from your team, your mechanics, your engineers, as well as yourself. Vettel’s detractors often attribute his success to the Adrian Newey-designed cars, but Stewart points out that “you need somebody to drive it”. “His achievement in winning back-to-back titles has been extraordinary and should not be dismissed or diminished on the grounds of him having what has generally been the fastest car.